India is moving towards becoming a cashless economy. There was a lot of corruption and black money floating in the market. Our Prime Minister, did a surgical strike in one move and it was a check mate. For few days, every one is facing inconvenience because of demonetisation but everyone seems to be bearing it happily. We all feel that good times are ahead. 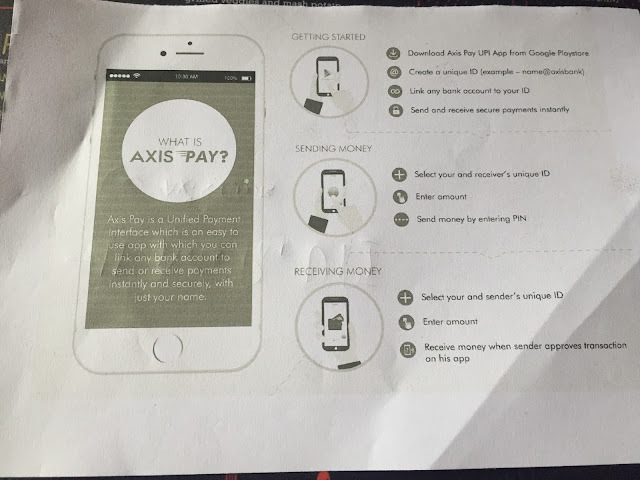 Axis Pay UPI app is an app with which you can send/receive money using any bank’s account, instantly using just a unique ID. It works on Unified Payments Interface (UPI) which allows users to transfer money instantly without knowing the sender’s or receiver’s bank details. The money can be transferred by simply using a unique ID. Axis Pay allows all transactions to be at least 2 Factor Authenticated, making it completely safe and secure. Apart from this all your financial transactions have a daily transaction limit. Axis Bank UPI app has been a pioneer in such attempt at customer service. No matter which your bank is, you can use this app for transactions and the funds will be sent and received in your account in your bank. This is a secure payment that uses just your name on the mobile app. The Unified Payment Interface (UPI) can be thought of like an email ID for your money. It will be an unique identifier that your bank uses to transfer money and make payments using the IMPS (Immediate Payments Service). IMPS is faster than NEFT and lets you transfer money immediately and unlike NEFT, it works 24×7. This means that the online payments will become much easier without requiring a digital wallet or credit or debit card. Verify your account and set a pin. Axis Pay is user specific. It requires a 6 digit passcode to login to the app. So no one else can use it on your phone. Be it the fee for your child’s tuition, payment to a wedding decorator or that contractor who needs to be paid for your house’s renovation, Axis Pay ensures that life must go on. That is the agenda of UPI app. **Currently this app is for Android users but iOS users, do not worry. Within a month, this will be made available for iOS users too. The maximum transaction limit for every fund transfer transaction in Axis Pay is Rs 1,00,000 (One lakh). The daily limit on fund transfer for every user in Axis Pay is Rs 5,00,000 (Five lakhs). Let us make India better. a nice overview Kiran from the new app from Axis Bank...would be looking out for more such interesting things in future!! !